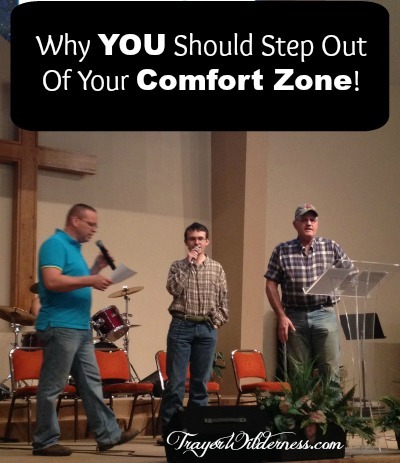 Why YOU Should Step Out Of Your Comfort Zone! Do you realize how beneficial it is to step out of your comfort zone? Our comfort zone is a place that makes you feel comfortable, it may be a place for some of us to re-energize, but it is also a place that we stay in just because of the comfort it provides. Without stepping out of our comfort zone we more or less just exist. By staying in this comfortable spot we don’t have a chance to expand in our personal life, professional life and in anything we do. We don’t get to experience the place that are intended for our growth. That is right, by stepping out of our comfort zone we enable ourselves to expand into amazing places. I’d like to share a story with you of something that happened this week with the Mountain Boy. Two weeks ago Thursday, the Mountain Boy and I headed to our church for the music practice for the Sunday services. The Mountain Boy LOVES to sing. He listens to K-Love and Moody Radio ALL the time. When he hears a song for the first time, he is able to remember EVERY word as though he has heard it hundreds of times. This is something that just comes naturally to him. He has a great voice and sings all the time to me and to the animals every day when he is caring for them, HOWEVER… With the Mountain Boy being high functioning autistic, being amongst a lot of people, being in the spotlight and certainly singing in front of people is not something that is comfortable or comes naturally! It is actually something that is VERY hard and VERY overwhelming. The first Thursday, he just sat played his small hand drum and sang without a microphone. He sang some fun songs that he knew well and was inspired to grab the microphone for the next song, only to find that they were finished for the evening. Honestly, though, this in and of itself was incredible for him. He was upfront, on the stage with people he does not know super well yet (we just recently started going to this church more regularly). I also wanted to mention that the Mountain Boy has been driving on his permit since last summer and he is heading to take his driving test this Friday. So keep him in your thoughts. For autistic people it is very overwhelming also when you are having to do a lot of things at one time. It is overstimulating and can be difficult. He has been pushing through his struggles and barriers left and right and continuing to step autism into the ground! So you may be able to imagine the depth of how overwhelming driving and then taking on even something more personal as singing in front of a crowd or with people he is not familiar with. In his past, such a combination would have given him such great troubles and this week you would have never known…. He is taking it in stride and overcoming EVERYTHING! So this Thursday, he drives us to the church and we head in… He sits down, grabs his mic and he is ready!!! I was totally WOWED!!! So they started to sing and the pastor was actually surprised that he knew the first song as he sang his heart out. I continued to watch and listen as they headed into the 2nd song to which he LOVES. I look up and motioned him to just stand up and do it…. And he WOWED me again – he DID!! It literally brought instant tears to my eyes as quickly then as it is now in writing this! If you could have experienced our years together and understood just how BIG of a step this was for him!! Oh – GOD is SO GOOD!!! ALL THE TIME!! I must say also that we are blessed in a church that everyone is so welcoming and it is a comfortable place to be. He is very receptive to his surroundings and reads things better than anyone I know with the exception of the Mountain Man who kicks it up a notch, but he is comfortable and that means a lot! I videoed him and took pictures so he could see himself perform when we got home. It wasn’t that he was just standing there with a microphone in his hands he was singing HARD, so hard that his veins were sticking out and he was closing his eye to Jesus!! He was just totally ROCKIN’ IT from his heart!! It was something very wild to see and for those of you that know Austin, you also know how BIG of a step this was for him. If only Mountain Cousin Jonathan was here to see him…. He would be impressed…. He would really know just how hard that was for him because the two of them on occasion would attempt to sing together and Austin was too nervous. When we got out to the truck – I told Austin just how proud I was of him and he said it felt good and that he was able to do it because I encouraged him which, of course, made me tear up again! Seeing someone step out of their comfort zone and accomplish something that you know they viewed as impossible is an incredible sight! No matter who you are, where you are in the world or the circumstances in your life, there is ABSOLUTELY NO reason why YOU can’t reach your dreams…. The first thing you need to do is to take that first step OUT of your Comfort Zone and into your future! You can do this! In the Mountain Boy’s own words he said it was such an exciting time. The Mountain Boy also wanted to offer all of you some encouraging thoughts – JUST DO IT! Try it today, How Are YOU Going To Step Out Of Your Comfort Zone? 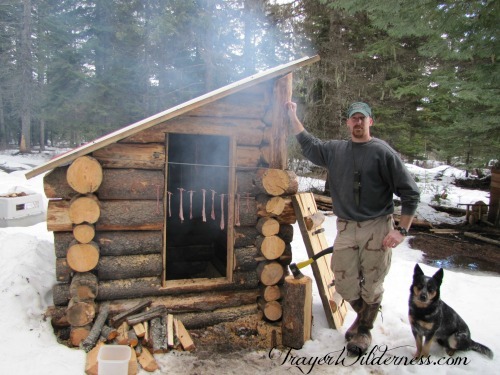 When you think about homesteading and off-grid living, maybe some of you think of “Little House On The Prairie” others may think of a Mountain Man living in the wilderness. Both scenarios are something that appealed to us and fit us well. I was always awed by stories of our ancestors and the original settlers. We felt we were living in the wrong era and wanted to create our own era living off-grid in a modern world. We wanted this dream so bad that we packed up a 24′ enclosed gooseneck trailer and a 26′ U-haul and traveled cross country from PA to ID to the raw, overgrown wilderness land that we purchased site unseen from PA. Now, just because we purchased it site unseen did not mean we did not do our homework. We did do our homework being sure that the property had legal easements and right of ways, water and mineral rights and a clean title, but we move fast and we refer to ourselves as embracers. We embrace our dreams! This was the best thing we could have ever done for ourselves and our, at the time, 13 year old high functioning autistic son. Our lifestyle and location completely enabled him to thrive. We are very passionate about our lifestyle and it is our goal to share our knowledge and educate and our successes with autism is no different. 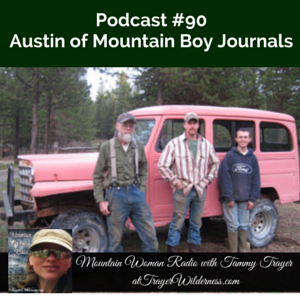 Read more on What We Have Learned and Conquered with Autism, listen in on my radio show where I Interview Austin of Mountain Boy Journals on Autism, and learn The True Blessings of Homeschooling a Special Needs Child. 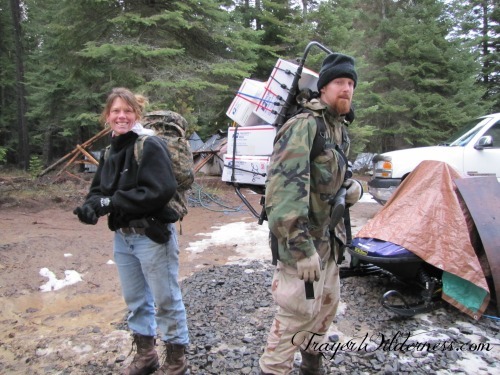 When we arrived in Idaho we set up an 8′ x 14′ canvas wall tent where we lived for 8 1/2 months while we built our home. We moved in to our 100% solar off-grid homestead with a foot of snow on the ground. 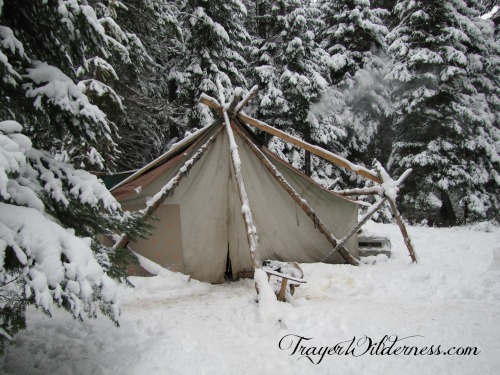 Our first winter we were unable to drive out of our property for 8 weeks due to the 36″ of snow that fell at one time and continued to fall and you know it was the most amazing winter I have ever experienced as was my experience in the tent! Simple Living at it’s finest, back to our roots with dirt at our feet, meals in the outdoors and the sounds and smells of the wild putting us to sleep at night and waking us in the morning! I would relive that all over again in a heart beat! Those 8 weeks back here our first winter were a cake walk for us and actually something we will all remember fondly. My Mountain Man and I grew up on farms with traditionally minded parents. Our canning shelves were always full and the cold cellar or root cellar was as well. We hunted for our meats growing up and do the same today as a family. So one of my first priorities in September our first year here was to stock us up well on food. Our son is on a gluten free and casein free diet for over 10 years. It has been a gradual process, but we no longer eat processed foods. Our first year here I was canning food on a grill burner while still helping to build the house. We stocked up on all our raw ingredients in 25, 50 and even several 100 lb bags. We quickly switched from a grill burner to cooking on our woodstove eating some of the leanest, healthiest venison and elk meat you will find. In the summer months we enjoy harnessing the sun, cooking our food in a Sun Oven during the forest fire season when it would be risky to have a fire. I am currently part of a Cooking Outside E-course where I am teaching how to cook in a Sun Oven. Living off the land is what we desire. Our goal is to be as self reliant as possible and still keep God leading the way and the beauty is, he has our backs too! 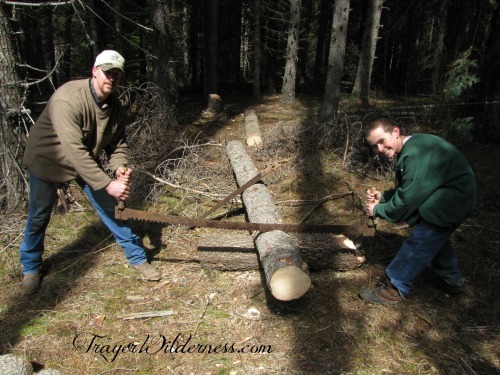 When we moved into our home there was a foot of snow on the ground and we were already onto our next project building a traditional log smokehouse. We were spoiled growing up with amazing smoked meats and being able to not only flavor our meats, but to be able to cure our meats was an important aspect that we wanted to be certain we were ready for. 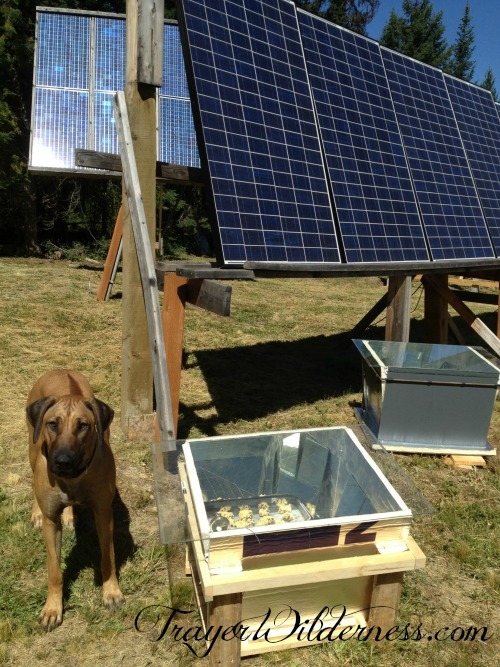 We then added 30 laying hens, meat rabbits and later we added honey bees, milk goats and a horse. All of which play a big roll in our sustainability. 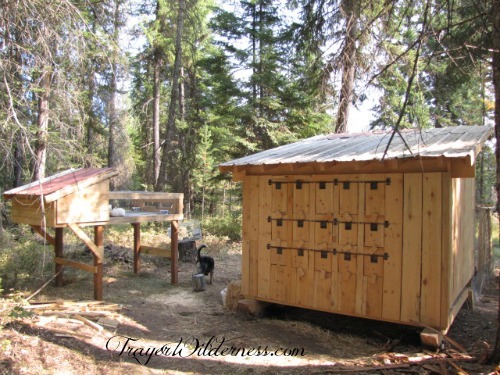 We enjoy having fresh eggs, rabbit meat to supplement the elk and venison, our own fresh honey and goats milk and a horse to get us around and do some of the chores on our homestead. Just a little tidbit of information for you, if you are unable to drink cows milk, there is a good chance you can enjoy goats milk with no problem. Goats are unique and personable creatures and a joy to have around. I love milking them and we utilize their milk for ice cream, cheeses, cream cheese, yogurt, butter and the list goes on. For those of you that have had goaty tasting goats milk – add an ice pack to the bottom of the milk bucket while milking or immediately after milking place the milk in the freezer for a bit and you will remove that goaty taste you once experienced. We forage berries, teas and our medicinal plants from the wild. We preserve our berries, teas and medicinal plants as well as our garden bounty each year in various ways. We dehydrate, dry naturally, can, make tinctures, salves and ferment filling our canning shelves and medicine cupboard. This week we processed 75 lbs of carrots which gave us 74 quarts, two gallon freezer bags and a meal. We also canned 30 quarts of our chili sauce/ salsa. We were able to get our garden in this year. It did not produce as much as we would have liked for our harvest, but it put a lot of food on our table. There will be more to come on this, how we designed it and why and how we get by with such a short growing season. Our greenhouse is framed out, but due to other responsibilities it has not been completed as of yet. When this is finished we will be able to have garden vegetables all year round. 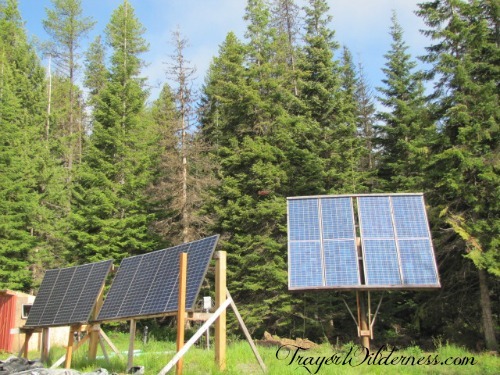 Something else to keep in mind with being off-grid is you wouldn’t need to give up things really – you just need to learn to be more frugal and focus more on the sun. By that I mean that you wash your clothing and do things that require a lot of power on sunny days, you turn the lights out when you leave a room, you use low wattage light bulbs and efficient appliances and you enjoy the simplicity of an oil lantern because you can! 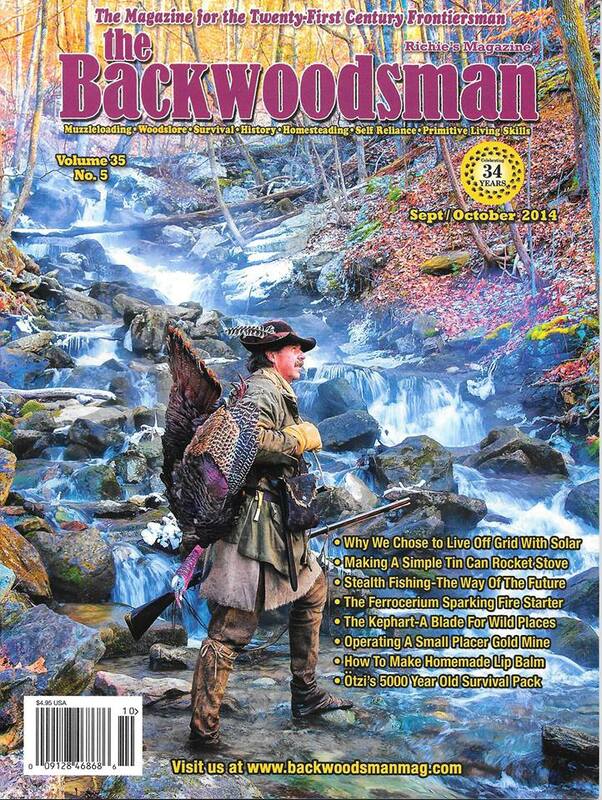 🙂 You can read more on our solar situation in my upcoming e-book and also in the Sept/Oct 2014 Issue of the Backwoodsman Magazine. 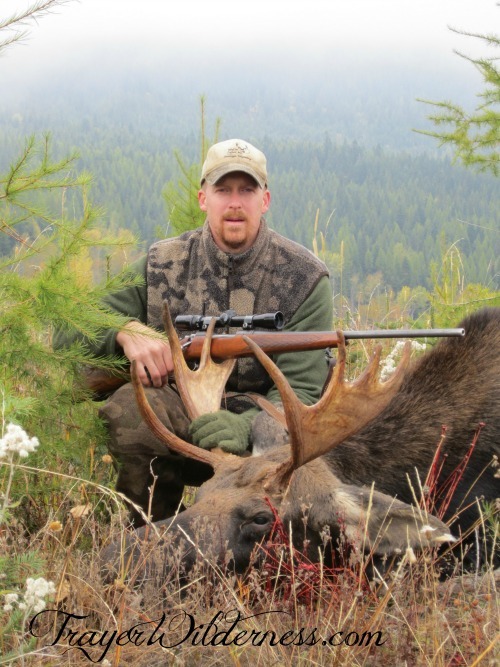 Last year, the Mountain Man was drawn for a moose tag here in Idaho so when myself, the Mountain Man, the Mountain Boy and two guest got our bucks we needed to also can the deer, putting 113 quarts of venison on our shelves too. 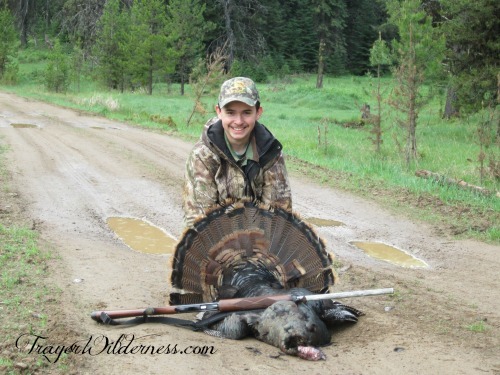 We have filled our turkey tags each year and enjoy hunting grouse and other game birds as well. Fishing is something we thoroughly enjoy, but have no yet had the time. When we hunt each season we utilize everything we can from the animals. We butcher, process and smoke our own meats. We eat the heart and liver, all the meat, cook the bones down for bone broth, use the sinew for cordage, use the bones and antlers for tools and varying projects and brain tan the hides for clothing, bags, sheaths, shoes, etc. We not only hunt, but enjoy our trapping season as well. Beaver back straps are added to our menu every season. Our lifestyle to most would be too much work, but to us the work is rewarding and a dream come true. We live very frugally by choice and make most of what we need. The Mountain Boy made wooden eggs for the laying boxes to help entice the chickens to lay better. The Mountain Man is a blacksmith and a MacGyver if you will! I always say he can make a pistol with a paperclip. He makes all our tools, hinges, decorative metal items, many survival and traditional hunting tools and even spikes and nails. Pretty much you name it he will make it. He has an amazing mind and has also invented and fabricated several survival tools as well. This leads me to share with you 1st how we make a living on our homestead. We are resourceful people and haven’t put all our eggs in one basket. I am a web designer and programmer by trade for the last 24 years so this what has afforded us the opportunity to live such a lifestyle. We started out with satellite internet which was an internet connection, but it was horrible and expensive because of all the uploading and downloading required for my job so when a young entrepreneur leased some land on a mountain side which was adjacent our eves we didn’t hesitate on switching. We have faster internet here than we did in PA and it is cheaper so we are blessed in a BIG way. Now, since we arrived here I embraced yet another dream and I have taken up my dream to write. 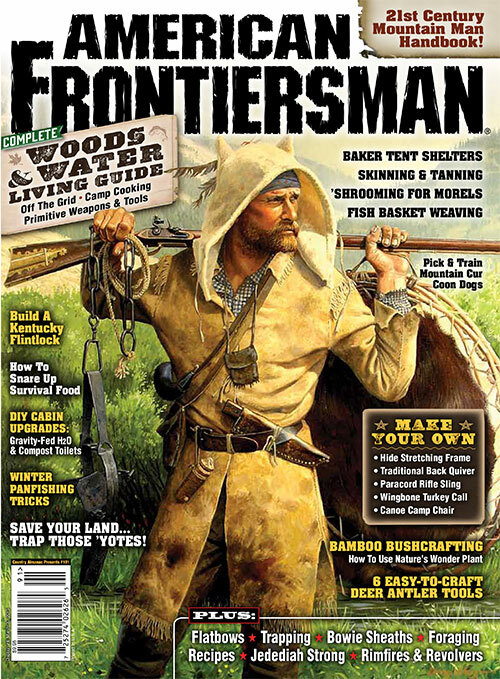 I currently write for The New Pioneer Magazine, American Frontiersman, Self Reliance Illustrated, Prepare Magazine, Cabin Life Magazine and Backwoodsman Magazine. 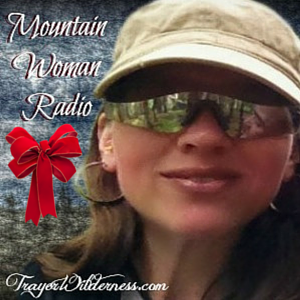 I am also in the process of writing several e-books that will be released before the end of the year, I offer my Mountain Woman Radio every Wednesday with the SurvivalMomRadio.com, I educate on essential oils and sell essential oils and I am a soap and candle maker too! We utilize our talents to help us provide an income. 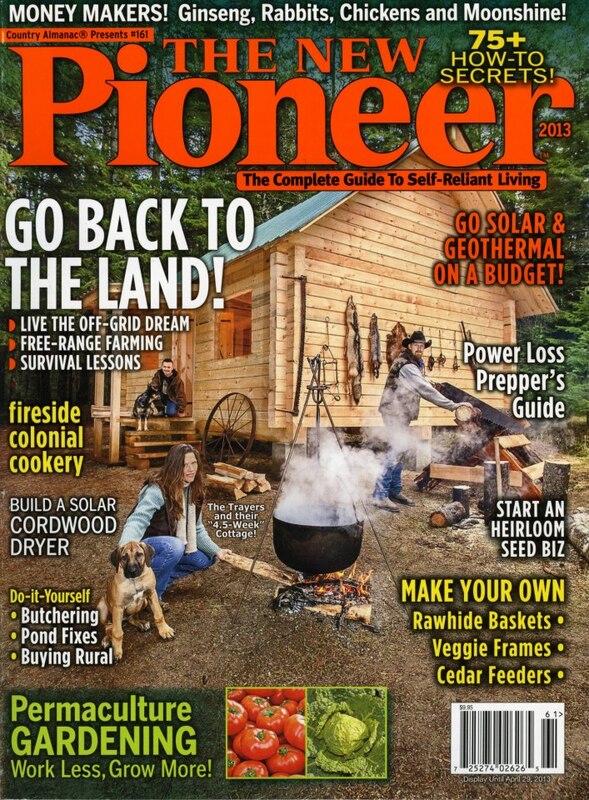 We were blessed to featured on the cover with our cabin in Issue #161 of The New Pioneer Magazine along with my debut article. The Mountain Boy has built himself a nice business for himself as well which can be found at MountainBoyJournals.com. He makes traditional style elk hide moccasins and paracord survival gear. In addition to working, we also enjoy playing! Our version of play is not always what other people would consider playing, but we thoroughly LIVE for being in the wilderness. Every chance we get we are out exploring new area of the wilderness and take our survival packs with us and practice our skills regularly. We not only practice our skills regularly, but we also educate on the importance of knowing not just modern forms of survival, but incorporate traditional and primitive skills into our skill sets. We practice such things a solar ignition, bow and drill fires, primitive methods of hunting and trapping, building shelters and most importantly being sure that we have the right equipment in our packs. We live among mountain lions, wolves, bear, coyote and protective moose with young so we feel it is very important to be protected in our environment and know how to survive on our own if something were to happen. We each carry the necessary items while in the wilds in the event that we are separated and we all know the same skill sets so that we know each of us could endure the wilds in the event of an emergency of any kind. I feel that women should make every effort to protect themselves and we feel that all members of the family needs to be well versed in the outdoors and survival skills. We feel very strongly that knowing traditional and primitive skills in every aspect of our lifestyle is important. Our country is not in a good way and if the modern day conveniences were to completely disappear we would still be able to thrive and that my friends is our goal. We utilize traditional tools all over our homestead from my kitchen with all hand tools, to the smithy utilizing tools from our grand fathers and great grandfathers to felling trees. Not only is it important to have these tools, but to know how to use them. Living such a life requires you to roll with the punches and take each days adventures as they come. Things break, the unexpected happens and as in the picture above – the snow melts bringing mud up to our eyeballs so this day required a 10 mile trip into the post office on foot to pick up our mail. Our son is no longer 13, but soon to be 18. 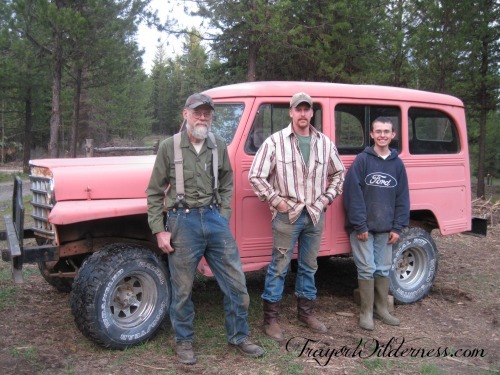 I am a proud mother of a young man, who at age 7 could not communicate well and form full sentences to sharing my days with a young entrepreneur, a young man with an Idaho Driver’s Permit in his back pocket and also the proud owner of a 1951 Willy Jeep that he plans to restore! We have been greatly blessed! We are learning new things daily by choice – I feel that when you stop learning you stop living. Remember that ANYONE can embrace such a lifestyle… It just takes heart, determination, and the willingness to learn new things! So if I can leave you with something today, embrace your dreams and look to a more traditional lifestyle to move your family into the future. Be sure to subscribe to our newsletter to keep up with all that our family has to offer. We will also be offering webinars in the new year on blacksmithing, brain tanning, canning, survival skills, etc. Our schedule will be posted soon and you can subscribe here to receive the upcoming schedule. 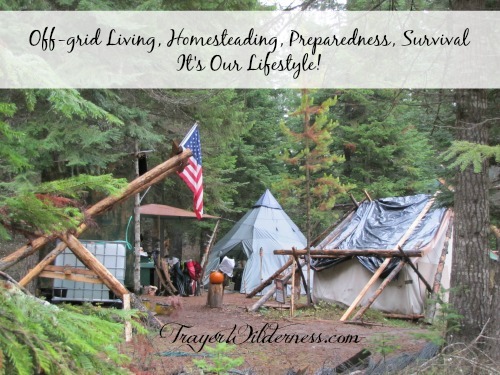 Off-grid Living, Homesteading, Preparedness, Survival – It’s Our Lifestyle! Are you ready to embrace such a lifestyle? If you have questions for us be sure to leave a comment below, we would LOVE to hear from you…. Live Free or Die follows five individuals who are living off the grid. The series airs weekly at 10/9c on the National Geographic Channel in the US, and will be picked up internationally later in the year. 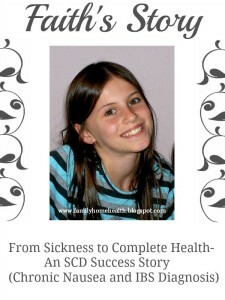 I’d like to thank Kristi from FamilyHomeHealth.Blogspot.com for sharing her post titled “From Chronic Nausea and IBS, to Complete Health an SCD Diet Success Story“. For more information on the SCD Diet. This post caught my eye and I felt was very worth sharing. Honestly, I was not aware of the SCD Diet and I feel that Faith’s story is important for other parents and individuals to be aware of the symptoms and the simple solution vs all the medications. I keep saying it is best to go to a whole foods diet and remove as much as you can if not ALL processed foods from our diets! Our foods are really toxic today and people do not realize the horrible affects the preservatives and additives have on our bodies. The other thing that was important here was how this all started with a virus. Being able to naturally detox our systems after viruses and the common cold can be so important. I LOVE my supplements (I have never been able to take other supplements – they always made me sick in some way so I HIGHLY recommend these) I take daily to keep my system running smoothly and I use Detoxification Blend of essential oils or the same in a gel cap for a gentle detox, Probiotic Defense Formula & a GI Cleansing Formula, and Digestive Enzyme Complex to help keep my stomach bacteria where it needs to be. Honestly at age 44, I have never felt SO good and with SO much energy! It is important to take care of our bodies, eating whole foods, providing it with the nutrients it needs, getting enough sleep and using non-evasive preventative and natural medicines when necessary. I have been using Essential Oils for years and I am very pleased with the specific Essential Oils that I have chosen for our family. I thoroughly enjoy sharing my knowledge with others and inspiring families to take their families health into their own hands. If you are interested in learning more about essential oils, be sure to sign up for my Essential Oils Newsletter. Using the links above you will be able to view my store and even shop if you so desire. If you are interested in receiving your oils and products at a wholesale price please email me at oils@trayerwilderness.com. I did not want this to sound like a sales pitch, but it may have ended up so. My intention behind mentioning all of this is that I am very passionate about being able to help people heal with diet, supplements, herbs and essential oils. Our Mountain Boy is high functioning autistic and through my deep desire to help him he is 97% healed of autism due to God, diet, supplements, herbs, essential oils and a lot of love!! So if you are interested in learning more about oils it would be with a great love and passion that I would take great pride in helping you. Also I would like to point out ALL the other fantastic posts that were shared and another that caught my eye because it is also a passion of mine and I LOVE her canning cupboard is Vickie from Making Our Sustainable Life and her canning cupboard. There was one other that really caught my eye was Kelly’s from SimpleLifeMom.com and her post 3 Homemade Toothpastes – great variety. LOVE IT!! 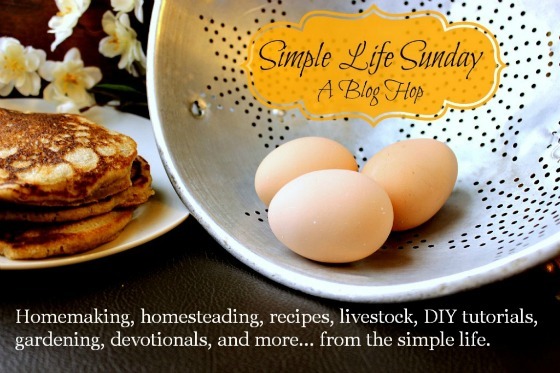 Thank you all for joining me today – our Simple Life Sunday just keeps getting BETTER and BETTER.